Sh. 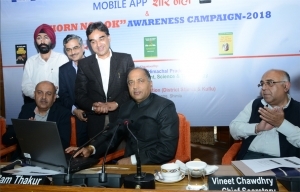 Jai Ram Thakur, Hon'ble Chief Minister, Himachal Pradesh, launched the Shor Nahin Mobile App on 3rd August 2018 at Shimla with the objective to reduce noise pollution in the State of Himachal Pradesh which is known for clean air and pure environment. The Chief Secretary, HP, ACS to CM HP, ACS Environment & Forests, Additional Principal Secretary to CM and all Secretaries/Heads of Departments were present in the launch function. From NIC HP, Sh. Ajay Singh Chahal, SIO NIC HP, Sh. Sandeep Sood, TD, Sh. Paramjeet Singh were present. Hon’ble Chief Minister appreciated the effort and hoped that the Mobile App will meet its objective. The NIC HP has developed the Shor Nahin (No Noise) Mobile App on Android platform for the Department of Environment and Technology, Himachal Pradesh. Sh. D.C. Rana, Director informed about the steps taken to reduce noise pollution in the State and also got launched the Horn Not OK campaign in the two Towns of Shimla and Manali. He gave a presentation on this and hoped that this voluntary campaign will pick up in rest of the towns of the State. Sh. Sandeep Sood, TD and HoD, NIC Himachal Pradesh Competency Centre for Mobile Apps gave a presentation on various features of the mobile app to the officers present. 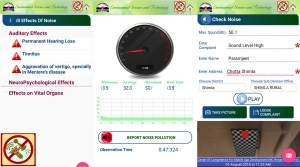 The App can be used by the citizens and District Administration (DC, SP, SDM, SDM, Pollution Control Board officials). A citizen has to get the mobile phone verified through OTP to report noise pollution case by recording the audio, reporting GPS location provided the noise level is above the threshold level, which is also checked through the Mobile App itself. Based on GPS coordinates, the concerned district officials get the reported case in their dashboard on the mobile App, which they access through their user credentials. Thereafter, appropriate action can be taken and status updated through the Mobile App for the benefit of the citizen. The App captures GPS coordinates of the reported cases and plots these on the map to identify noise prone areas, where the Administration can take appropriate long term corrective measures to reduce noise pollution. It can be downloaded from the web portal of Himachal Pradesh Government, NIC eGovernance Mobile App Store, Google Play Store etc.